Christmas Ornaments Made in USA - 2003 Supreme Court Sphere Ornament - A Christmas Ornament Co. 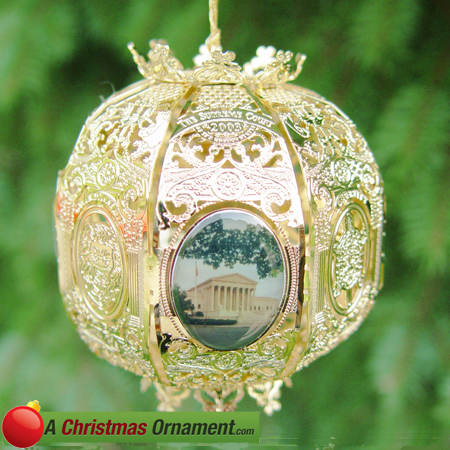 The A Christmas Ornament Collection presents 2003 Supreme Court Sphere Ornament. The 2003 annual ornament is a work of art. This extraordinary, eight-sided ball ornament is plated in 24kt gold. It has four photographs of the Supreme Court building, and is also engraved with many icons found throughout the Supreme Court building.